There haven’t been too many cases that I would consider as an option for my own rig that weren’t made by Lian Li, Fractal, SilverStone, or Zalman. However, Antec thinks they can get on my radar by wooing my alter ego, the one that plays Call of Duty ’till 4 in the morning jacked up on Mountain Dew, Sour Patch Kids, and stale Cool Ranch Doritos. The GX700 is a military inspired chassis with some nifty features, but does it have enough to find a home in my home? The military inspired GX700 comes to the market at a prime time. The upcoming release of Call of Duty Ghost and Battlefield 4 has us drooling already and Antec is banking that we will be building new battle rigs to fulfill our FPS addictions. The purchase of high-end video cards, motherboards, and processors can be an expensive endeavor… however, the GX700 comes in at a very attractive price point, $59.99 at Newegg. First, this is a Mid-Tower chassis constructed almost completely with metal. Plastic elements are pretty much limited to drive trays, locking mechanisms, fan filters, and miscellaneous accents. The chassis weighs in at just under 14lbs, measures 19.7″ x 7.9″ x 17.7″, and is designed to support Standard ATX, microATX, and Mini-ITX motherboards. To be sure our rig lives up to its gaming potential, the chassis is capable of housing a GPU up to 11.5″ inches long. Cooling is handled by two top mounted Antec 140mm exhaust fans, one Antec 120mm rear exhaust fan, and plenty of options for additional cooling. Intake is barren, but there is room for two 120mm fans up front and room for one 120mm fan on the side panel. Up front behind a green metal filter panel held in place by 4 metal thumb screws is an air filter. 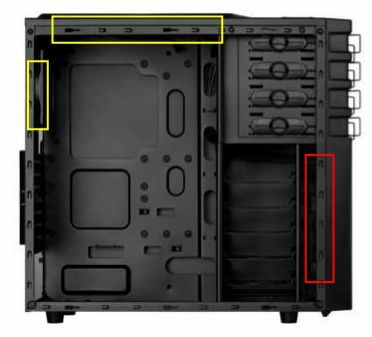 There is an additional removable fan filter below for your PSU intake.